You've likely seen news reports, Facebook posts, and/or Twitter updates about celebrities and movie trucks spotted around Charlotte the last few weeks (I think Woody Harrelson and Lenny Kravitz have been seen the most). As I blogged about last month, this local Hollywood action is because The Hunger Games movie was setting up shop to film its Capitol scenes in Charlotte and Concord ("'Hunger Games' Movie Filming Headed to Charlotte"). Now, thanks to MTV, on Sunday night we'll get to see the very first footage from the movie that's not scheduled to be released until March. 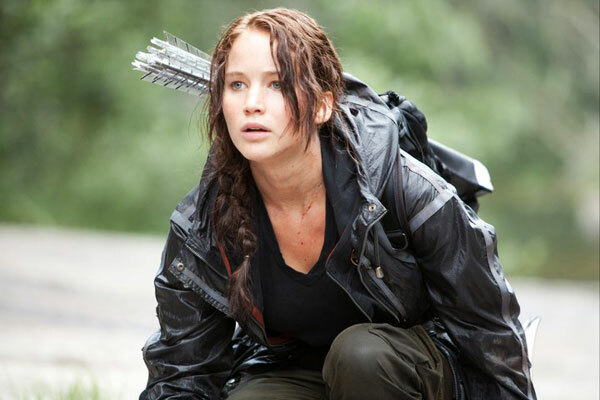 Jennifer Lawrence as Katniss in The Hunger Games. Photo by Murray Close/Lionsgate Entertainment via MTV.com. According to MTV News, actress Jennifer Lawrence will introduce the exclusive preview during the 2011 MTV Video Music Awards, which airs Sunday at 9 p.m. After the show, The Hunger Games clip will be available on MTV.com.